We are really pleased to be continuing our Live Music offering here at Deepdale Backpackers & Camping, by welcoming back Marina Florance for her very own Sunday Session. Marina started performing late in life, but her fantastic voice, guitar playing and wonderful songs have gained her recognition and awards from stations like BBC Radio 2 and BBC 6 Music. There will be sofas, benches and seats to enjoy great music. There�s no bar, so please bring your own drinks and snacks. We can�t imagine a better end to a early Winter weekend, so why not join us. Book a bed with us in the Hostel or a pitch on the campsite and entrance is included. Otherwise, tickets available in advance from our website for �3. 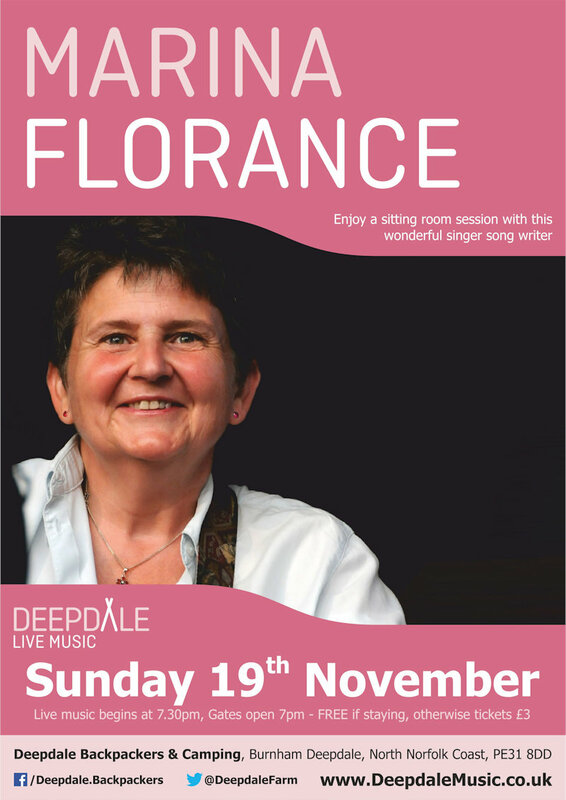 Marina Florance - Sunday Session - We are really pleased to be continuing our Live Music offering here at Deepdale Backpackers & Camping, by welcoming back Marina Florance for her very own Sunday Session.